Lots of android mobile come with a very low internal storage which has given low memory notification after a few downloads of the applications. If you have low storage phone then it is good news for you. You can increase the internal memory by follow these method. This is absolutely true that no way to increase internal storage size of your phones, but you can allocate some part of your memory card for your phone to install applications. before follow these guide to increase internal memory on android, you must be root your phone. If you have any MTK device then you have once more option to increase internal memory Click here. 2. Use memory card reader and don’t use a phone internal memory. 6. Backup your memory card and phone for safe side and copy all the data on your computer. Step 1: Take backup of your memory card and phone. Step 2: Connect your memory card to computer by memory card reader for make partition. Note: Don’t use a phone via USB cable for make partition of memory card . Step 3: Download and install Partition Tool on your computer. 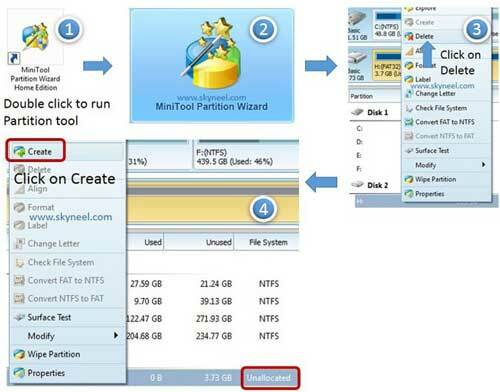 And double click to run this Partition tool and select MiniTool Partition wizard. Right click on your memory card and click on delete. See in image 2 and 3. Step 4: You will see the memory card showing unallocated space, Now right click on the memory card and select create. See in image 4. Step 5: Create as: select primary and file system according to you card space. Note: I have 4GB memory card so use FAT32. If your memory card size is less than 2GB then select FAT file system. If your memory card more than 2GB, then you should select FAT32 file system. Step 6. After that choose all the unallocated space and right click select Create. Create as: select primary and Choose EXT2 or EXT4 file system and click on OK. See in image 6. Step 7: Now click on apply button on the left top corner menu. Then click on yes and Wait for finish, you will get successfully partition of your memory card massage on your desktop. Step 8: After then copy your backup of data on your computer back to the memory card and insert memory card in your phone then Start your phone. Step 9: Let’s Configure Link2SD app on your phone. Downloaded Link2SD app from Google play store on your phone. Open Link2SD app, You will see a tab, In this tab Link2SD app asks you to select the file system of your second permission, choose EXT2 or EXT4. After Then click OK, the phone will ask you to reboot your device then click OK. Step 10: After the restart your phone tap on Link2SD to run app and Go to on the top tab, you will see a funnel-like icon or three horizontal dash icon, click on it choose “on internal”. See in Link2SD image. Note: that’s all but you install an app you should go to settings from the menu and click on auto link and then select the three options again and OK.
1. Your mobile must be charged at least up to 80%. 2. You must take a backup of memory card on your computer. 3. Your mobile/tablet must be rooted. 4. CWM/TWRP recovery must be installed on your mobile/tablet. 5. Install Link2SD app on the device from the play store. Step 2: Now we make partition of your memory card by CWM/TWRP recovery. Switch off your mobile and boot into recovery mode by any method or using appropriate key combination. Note: If touch not works in your CWM/TWRP recovery then use volume keys for navigation and use power or home button for selection. Step 3: Sot to advanced option. Then select partition SD card option. Now choose ext size and create. Note: The size of partition should be less than your memory card size. Step 4: It will take few minutes for partitioning SD card. After successful partitioning of SD card then go back and reboot your device. Step 5: Configuring Link2SD app: this process is same as first method. Follow steps 9-12. Now you have more free memory in your phone. So don’t wait, try it. And bookmark this page for future assist for you. I hope you like this Increase internal memory in Android Mobiles guide from which you will be able to easily Increase internal memory in Android Mobiles without any extra efforts. If feel any problem in this guide then please use comment box. Thanks to all. After root, partition of memory card (fat32 & ext4) through “Partition tool” & then worked with “link2sd” software for use sd card as in ternal storage, how can i know ext4 storage used as internal storage. Because my internal storage capacity of my mobile still shows same as shown before doing this process. sire I have a Micromax canvas knight . when I try to download any app for play store it says low space . m fed of continuously getting dis msg plzz help me increase d app storage..
hi Abhishek does it work in lava iris349i ? Sir good day, I’vs got SAMSUNG GALAXY J1 internal memory 65mb, how can I increase my internal memory? I can’t receive a message or download apps because the internal is so low. Please help me on this matter. Thank you. Sir.. I don’t have micro sd card slot in my device but it have 12gb phone storage. Can i used the phone storage instead of micro sd? I have a rooted Sony Xperia ZR C5502, I wish to increase the internal memory. Please help. sir, my phone model no is micromax A66 and i fallow all the steps to increase the internal memory but it give me an error at time of selecting second partation as ext2 through link2sd app, error called “mount Script cannot be created . not allowed to su”, sir please tell me the solution for this …. swict off ur phone wait 5secs.hold together power key n volume +key n select wipe data resect click power key or volume + n click yes resect data n clck reboot . ??? ?what should I do ?? sir, me apna phone root nahi karna chahta because my phone in warranty or phoon root karne ke baad mobile out of warranty ho jata h.So,can you help me to increase my RAM & ROM. Sir my micromax a109 is hanking fom many days and is working by itself can you suggest me what to do sir. What options r there for MMX canvas tab p470? Pls let me know. Sir my phone micromax canvas gold a300, it doesn’t have any external memory, it has only internal memory of 32 gb but they are given only 1.5 gb for apps. Now it was full, iam not able to install more apps, please help me if there is any chance to increase memory for apps install in my MMX phone. can i do this on lollipop 5.0? Is this process works with micromax A116 ? I cant find the delete option. Can i root and increase internal storage of mmx a65? How? I am not able to store any pictures or videos after second partition…..pl help!! I did as instructed. But when Link2SD starts and asks for the second partition (ext2, ext3…) this error appears: "mount-script could not be created. your /system partition has not enough stoage space." how is this possible? I have only Google play (and Link2SD) installed. I have mmx120 it can go for kitkat 4.4.4 and lolipop Version.5 Please tell me. my device is rooted but by he first method it shows "Mount not found" give me solution…. My device is lava iris402e…. To increase phone storage phone must be rooted? Pls help me how to solve this..
Hi sir,i cant get what to do,please give a video tutorial. Just do it step to step. it is very easy. try to root your phone by given method. If it is not work then we make new root method for your phone. So try this then reply me. When you insert SD card in your Android phone then by default downloaded video and other file save in external memory. I will follow all step of increase memory in Micromax A177..after that I will install link 2sd app.and create link…but my internal memory of phone still full..why??? I'm using micromax canvas elanza 2 (a121) can this phone be rooted? How to root this phone? try this guide click here. If it not work then tell me, I will provide you next guide. do you want to root guide for your phone? 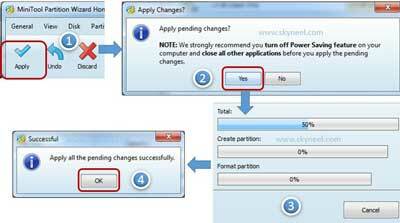 try this process step to step, you will not get any error. why should i not use my phone via usb for creating partition ? first you create FAT Partition then ext2. After complete this process you can move your apps on your SD card. Pleaaaaaaaaaaase tell me, is this method works on Galaxy Mega 6.3 android Kitkat 4.4.2 ?? can i use ext3 or ext4 instead of ext2 in my samsung galaxy grand i9082 – ext2 seems slow while processing ? root your phone then do it. Pl guide me what to do ? i tried in my karbon a4+ phone, but not worked fully, still it using my internal memory and not able to install more apps. i just did one mistake i.e. i format my sd card through usb connected to mobile phone, is it effects on this? yes, recreate partition of your SD card. Download play store app from this post click here and move it root/system/app folder then set permission wr-r-r and install it, if is giving error then restart your phone, it is automatically install by rebooting. did you set permission on this app? Sir plz help me! !! my problem is same as yours…sir please help me too…..
Hi Abhishek, can u please tell if the mentioned methods are safe to use. And does it work on lenovo 269i… It has a very low internal memory… Cant install whatsapp even… Need ur help badly. Thanks in advance. yes it is safe and it works on your phone. cant i increase my ram and internal storage at the sam time?? ?…i m using canvas A177….and if do can i use it for norml video and music storage. you can increase Ram by uninstalling some useless app and internal storage by this process. try this. hello sir…i just wanted to know that does this process also meams to increase ram?…if not what is the difference….and after doin this can i use my sd card anymore for normal storage like videos,musics etc??? No this is not increase your RAM, you can increase your system space for app and game and resolve low memory error. if forgot to use step.. it can make my phone crash? it can be work on NOKIA XL ? Is Rooting necessary for this above process ? No such file or directory found"
i have also tried Fat32 for my secondary partition, not working! Make first partition of ext file system then second one. I am using micromax bolt a58. I have rooted my phone.partitioned the sd card.Tried many options regarding the format of the partitions. But every time link2sd shows "Mount script cannot be created. No such file or directory found".Can you please help me with this problem. then make first partition of ext file system then second one. Don't use phone for partition via USB cable. i have a dilemma…moto E or mmx canvas juice a177….which one do you recommend??? my phone is mmx canvas juice a177 …could you tell me the rooting process for my fone??? when i am select ext2 i have getting an error (( mount script cannot be created not allowed to su ) Please sujjest how to resolve this ..
if your phone is rooted then give su permission. Not create folder this process says create partition and fist rot your phone then do it. is your phone is rooted? is there is any way to swap the external storage and phone storage in canvas juice a177…if it there pls post..
How to use 2and way? bro if u have any idea to increase the ram memory in my android (gingerbread). when i go to link 2 sd it give a warning that "LINK2SD COULD NOT OBTAIN ROOT ACCESS"….SO PLZ. GIVE ME A SUITABLE ANSWER. hi. can u make a video of expanding the internal storage for Micromax BOLT A58. Because i had tried but it did not work. i had partition and grant access to link2sd but when i select fat32 or any it says Error No Script Found something. i don't have A58, make first primary partition EXT2 file system and make other according to your memory card size is less than 2GB, select file system FAT. If it’s more than 2GB, select FAT32. as i have installed the partition tool and done with the 1st step, i have installed the link2sd app in my phone and done with recopying all the things back to mem card, but as i set my card in the phone, it says that i have unsupported file sys in the card and that lead to format of my card. but when i open the link2sd app in the phone, it is not even recognising the card, it says no card found, then what to do sir..
which is your phone model no? I made the right partition no problem with that and later I came to know that what exactly I have to do with link2sd app. Actually I was not creating a link of any app initially I had only moved the apps to sd card only but later when i found this linking option my problem resolved. I want to thanks a lot for this helpful information. Hi Abhishek, When i go for inquiry about MMX a77 jiuce, i hear from 2 mobile shop salesman that some problems in MMX a77 juice, thats why we do not buy a77 for customers… you can purchase only online… i view 2-3 complains on consumer sites also that customer purchase a77 from homeshop18 are not good. Donot buy it Micromax A77 has network problem. i will suggest you Micomax Canvas 2.2 A114. this set has good performance at low cost. Whats the difference between link 2 sd nd move to sd??? move to sd move your app data in your SD card not all app data. link 2 sd app make your SD card partition into internal storage and move all app data. Can we apply this method to Micromax A58 ? and whether warrantee of the mobile will remain same or it will be broken ?? yes you can try this method on your Mobile but it is root required and root broken your warranty. do not worry about warranty because when you feel any problem in your Mobile then flash stock Rom after then go to service center. Thanx for the reply! I will be more satisfied if will explain "flash stock Rom", how it works and how it will maintain my warrantee ? i Will post Root process of Xolo A600 and try these method for increase internal memory it is work in any android phone. what about the rooting process for micromax a66 which i already asked please reply fast…………..
Read this post click here and try both method and tell me it is work or not? i think one of method work for your Mobile, so try Second method first then first method. How to do my micromax bolt A58 rooted? Thanks. please send as early as possible. hai im using micromax a66 and i dont know how to root my mobile so please help………!!!!! Hi abhisek, pls reply my question…. i tried Farmroot Apk but there is a window saying CHECK VULNERABLE ''your device seems not vulnerable to exploit included in Farmroot'' then what to do???? do i really need a memory card reader for this task?? hi sir does it works in spice m502 model ?